I'm excited to host a giveaway for a Go! Baby. The winner, picked by Mr. Random, will receive a Go! Baby and three dies of their choice thanks to the people at AccuQuilt. Leave a comment telling me what you would make with a Go! Baby. You can check out the compatible dies here. Blog, Tweet and/or Facebook about this giveaway and come back here to leave one final comment. This giveaway is sponsored by AccuQuilt. The contest is open to US and international readers. The comments will close at 11:59 p.m. MT on Tuesday, July 12th. The winner will be announced Wednesday, July 13th. Good luck! and i follow your blog, thanks!! The first thing I would make is a big scrappy tumbler quilt. I've always wanted to make one but the thought of cutting it out puts me off. Hope I'm lucky! And I'm a follower in my google reader. From what I have seen online, it would be a great help in cutting out multiple pieces for quilting. Sounds like it would be fun to play with! I've gotten into hexagons lately...this would definitely help with cutting them all out! I would love to make anything with the go baby! There are so many possibilities! Thanks for a wonderful giveaway! I would use it to cut blocks with curves because, well, that is the only way I would ever attempt those quilts, and there are so many that I love. Really, I am not very accurate at cutting straight lines either, so the Go Baby would help cut my binding strips as well. Thanks so much! I am a follower, too! Thanks! I'd make something with rounded shapes like circles ouor Robbing Peter to pay Paul. Anything with shapes that are difficult to cut. I would make lots of custom jelly roll quilts using their 2.5 strip die! Terrific giveaway! I am a follower now. Thanks! I'd like to make a cushion with the tumbler die but I never will unless I have a Go! I would most certainly use the go! baby to make a super cheesy christmas quilt. have you seen that christmas die? And I commented about it in my facebook (Montse Pérez Bosch). Looks like such a handy machine! I would love to make a dresden plate sunflower quilt. thanks! I am a follower w/ google reader and enjoy your blog! Thanks- have a great day! I want to make baby quilts with applique embellishments. I see dies to cut birds and flowers which would be great! I follow your blog. Always enjoy reading your posts. I would finally make a circle quilt, placemat, mug rug or something with circles! Hello and thanks for hosting such a great giveaway! I'm a follower of your nice blog, thanks for the chance! I would love to make a tumbler block quilt!!! I would love one if these as cutting out anything I'd a bit tricky for me as I have poor health. Any decent sized quilt made with this device would be my choice! I would get some of the curved templates and make a drunkards path quilt, double wedding ring, robbing peter to pay paul.... I also think it would be fun to have some basic squares and triangle dies. I would like to cut up all of my scraps and just start sewing them back together. I would love to use the Baby to get my scraps cut and make a postage stamp quilt or a scrappy 9 patch. I would make some pinwheels with the half square triangle and a tumbler quilt and lots and lots of binding with the 2.5" strips! Oh wow! The birds, the critters, the stars, how to choose! I have 4 mini quilts to work on this summer. This would make a huge difference in the finished product. I would love a GO baby! It'll make quilting making so much easier and enjoyable, I hate cutting! It'll help me with everything I make! Thanks for the chance! I would make a pin wheel quilt or something with lots of triangles. Thanks for the give away! I am a follower through my reader. I would love a Go with a 4" quarter square, 4" half square, and chisel dies to make some of my fav hst quilts. Cutting is my least favorite part of quilting, so I would use this for everything! I would also be interested in doing some applique! I would make an applique quilt using those sweet birds! I would love to use the go 2 1/2 inch strips to make a log cabin! Hexagons make me shudder, so that is what I'd try first! I am an avid follower in Reader! I'm not a lemming, but I am a follower! I would love to get this and the 2" square die. I LOVE doing pixel quilts and in particular old school 8-bit video game quilts (all pixels). Cutting thousands of squares can get painful so this little "baby" would be so helpful! I've been wanting to hop on the hexagon bandwagon, and that's the first project I'd use the Go Baby cutter for. I would definitely make a quilt maybe a tumbler or hexagon quilt. Thank you accuquilt for the chance to win. First thing I'd make would be a quilt using my new circle dies. *S* I have found no way to cut those accurately, and I love patterns with circles. I've been following your blog on my Reader, but I am now officially #422 on your follower list. I do follow your blog! It's fun to relax for a few minutes and see what other quilters are working on each day. With the Go! Dies, I'd select the Funky Flowers and the Feathers to make a scrappy applique quilt. Then I'd play with dense quilting around the shapes. What a terrific giveaway! Thanks! I'd make a hexagon pillow, like the one that you posted. The first thing I would try to make is some bias tape with the 2.5" strip die. I'm guessing it could be used for that. I've also been wanting to make a circle quilt... so many possibilities! Thanks for the great giveaway! I also follow. Thank you! I'm a follower - love all your creativity and your use of colour - better than an expensive magazine, so thanks for saving me money! I have been on a half square triangle kick lately, and those little 1" triangle dies look awfully tempting. I've been cutting and trimming itty bitties so long, that would sure be nice. I've got dreams of an entire tiny triangle quilt, but don't know if I've got the cutting patience! If I were lucky enough to win the first thing I would make would be an I-Spy tumbler quilt for my son. Thanks for the chance! I would make a cute quilt for my granddaughter with the funky flowers and I think circles would be cute. Thanks for the great opportunity. I would work on a quilt made with my dad's pajama's. It's a long story, but I'd like to make one for each of my 5 remaining siblings. I am a follower and check your blog daily! Love it. Thanks for hosting a great give away! And I'd like the the equilateral triangle dies to make the Tennessee Waltz I've been meaning to make...for three years. Thank you for the fantastic giveaway :) I would probably give curved piecing a try first using the Go!Baby apple core die, then definitely something fun with the 3" HSTs!! I'm also a happy (non-new) follower and really enjoy your blog! I like the circles and the go rose of sharon...there are so many crafts to make with pre-cut fabric...then when my kids are bigger I can get back to quilting! I would make something with diamonds I think. Thank you for the opportunity! I would like to try the apple core die and make a quilt from that. Oh gosh this first comment is easy I would convince my friend to spend a day and create a rag quilt or two! I have been following your blog and enjoying it for quite some time now. I'd love to make a tumbler quilt for my daughter! There would be so many options, I don't know where to start making, with a Baby Go! I think I'd make a big hexagon quilt. Or a tiny HST quilt. Or a tiny square quilt. There are lots of great dies! I keep seeing those Go Baby tumbler quilts all over blogland. I "NEEEEED" to make one of those!! Thanks for the giveaway!! I'm a follower. Thanks again for the giveaway!! First thing I would make would be a hexagon quilt of some sort- after that, who knows! i would love to try & make anything with the go baby! I would love this for applique on baby clothing! I would love the opportunity to make something quickly and easily with circles! With a GoBaby I'd make a Drunkard's Path quilt, with the Drunkard's Path templates, of course! I like the Hexagon template and Apple Core template too. Thank you for hosting this great giveaway. I'm already a FromtheBlueChair follower, and have your RSS feed. Thanks again for this chance to win. Once, I saw a great quilt made in the tumblers pattern using an assortment of African fabrics. I happen to have a collection of those and would love a Go Baby to help me with all of that cutting! Oh...and I'm a follower of your blog, as well. I would love the Hexie, Strip cutter, and 4" HST dies. I would make the cutest baby girl quilt with flowers and dragonflies. Thanks for the chance to win! One of these days I've really got to win one of these!! I tweeted about your giveaway @LisaT63, thank you! Im not sure what Id make right away. I mean, I swore Id die before making a wedding ring quilt - may have to try. In the meantime, probably would add simple floral applique to plain quilts. A tumbler quilt! I have seen some great ones, but I'm not excited about cutting out all those pieces by hand. I'd love to make a tumbler quilt! I think I'd make a simple background with 3 dimensional flowers on top first. I'm all about the hexagon. Anything to make it easier to cut them out, especially when using scraps. I am a Follower in GFC, and also subscribed in GReader. Love your blog! I'm not sure if that's the right way to link back there. I would love to win one of these! I would love to use it to cut half square triangles. I'd definitely make a hexagon quilt, your pillow is just too pretty! Thanks for the chances to win! I would use the GO Baby to make hexagons for my hexagon charm quilt. I wouldn't probably get round to making anything, I would just convert my whole stash into small, perfectly cut pieces!! I am, of course a Follower. I think I would make a tumbler quilt! I would make a quilt-possibly a hexagon quilt. Hi! I am a follower of your blog! I have always wanted to make a tumbler quilt, so I would probably use that first. I'd get the tumbler die and make a tumbler quilt. Also interested in the apple core die, and drunkard's path. I would love to make a hexi quilt, for my bed. Thanks for the chance to win. I'd likely start by making some smaller wall quilts. I would make a hexagon quilt. I would make a tumbler quilt. I love that die. I would make like a gizillion hexies and then swim in them! Kati - you're da best!!! I'd make a drunkards path quilt. My skils with a rotary cutter do not apply to curves. i'd love to make a quilt with apple cores or drunkards path-- i'm far too impatient to cut either of those by hand. Blimey - took a while to scroll to end, but nothing like as long as it takes me to cut fabric out! 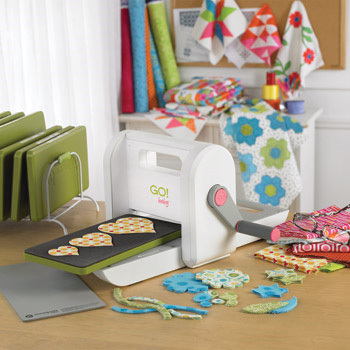 I would use the go baby to cut hexagons - lots of them for a queen size bed quilt.It Thanks for the chance to win! I've been wanting to make a Christmas wall hanging that has a Christmas tree made out of yo-yos, but don't want to cut out all those yo-yos. I also want to join the hexie craze, but same thing - don't want to cut out all that fabric for the hexies. I'm too old to be doing all that...I want to get to the piecing!! Thanks for the opportunity to participate in your giveaway! Can't wait to see who wins. I'm already a follower. And I'd like you to follow the comments down to mine, so you can pick me! Please!!!! Thanks for this opportunity. i would make a pieced hexagon quilt using the my GO! Hexagon-2", 3", 5" die. i have been dreaming of this design, but dread doing all the cutting!! i am a follower via google reader. thanks for the chance to win! I would make drunkard's path quilt. oooo I would make a tumbler block quilt! I would love to make binding and hexagons and a simple drunkards path-looking block with the circles.